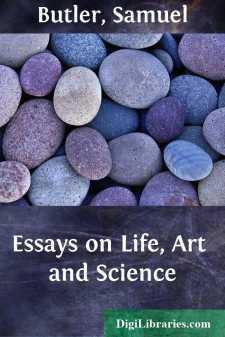 Two of the essays in this collection were originally delivered as lectures; the remainder were published in The Universal Review during 1888, 1889, and 1890. I should perhaps explain why two other essays of his, which also appeared in The Universal Review, have been omitted. The first of these, entitled “L’Affaire Holbein-Rippel,” relates to a drawing of Holbein’s “Danse des Paysans,” in the Basle Museum, which is usually described as a copy, but which Butler believed to be the work of Holbein himself. This essay requires to be illustrated in so elaborate a manner that it was impossible to include it in a book of this size. The second essay, which is a sketch of the career of the sculptor Tabachetti, was published as the first section of an article entitled “A Sculptor and a Shrine,” of which the second section is here given under the title, “The Sanctuary of Montrigone.” The section devoted to the sculptor represents all that Butler then knew about Tabachetti, but since it was written various documents have come to light, principally owing to the investigations of Cavaliere Francesco Negri, of Casale Monferrato, which negative some of Butler’s most cherished conclusions. Had Butler lived he would either have rewritten his essay in accordance with Cavaliere Negri’s discoveries, of which he fully recognised the value, or incorporated them into the revised edition of “Ex Voto,” which he intended to publish. As it stands, the essay requires so much revision that I have decided to omit it altogether, and to postpone giving English readers a full account of Tabachetti’s career until a second edition of “Ex Voto” is required. Meanwhile I have given a brief summary of the main facts of Tabachetti’s life in a note (page 154) to the essay on “Art in the Valley of Saas.” Any one who wishes for further details of the sculptor and his work will find them in Cavaliere Negri’s pamphlet, “Il Santuario di Crea” (Alessandria, 1902).